Taking hair color from flat black to dimensional sunshine is a feat at any level but when that black is stubborn box color, it's an especially impressive color correction. We spotted this miracle by Mykey O'Halloran who works in Melbourne, Australia and runs Unicorn Manes By Mykey @unicorn_manes_bymykey. O'Halloran spent so much time with his client that they truly bonded; they even discovered a possible family connection. "My client, Gemma, had not stepped foot in a salon for four years," O'Halloran explains. "Initially, she booked in to go a royal blue/ purple. I had never done her hair before and didn't want to give her any unrealistic expectations knowing there was a lot of black hair dye on there from doing it at home. I suggested our goal would be a combo of Manic Panic Professional Celestine Blue and Fuschia Shock in the classic cream, two of the strongest colors in the range that will truly cover almost any kind of warm level 7 + lift. The classic and professional Manic Panic shades are intermixable so you can make cocktails for coverage in color corrections like these. Usually I would recommend a strand test for this kind of color change but Gemma seemed pretty relaxed and realistic about whatever happened with her color this appointment and was prepared for a journey!" And the trip from dark to light took a full six hours. "Three hours in to her appointment, while I was juggling another mermaid color client (I have two clients at a time in my chair), my client ordered three bowls of dumplings from Uber Eats to make sure I ate because I was so hair-focused on getting a result I almost forgot to breathe! 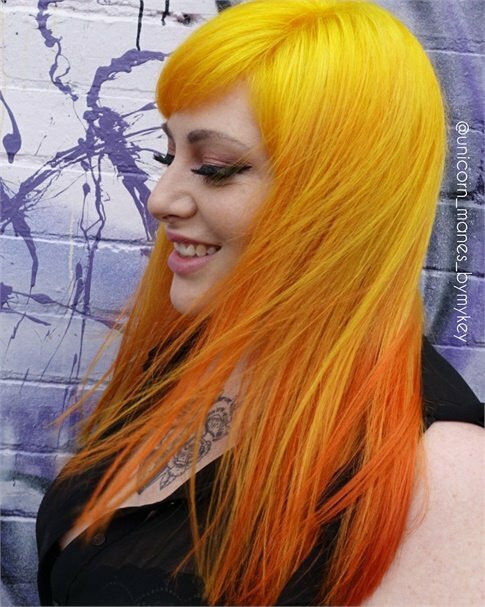 After drying her hair and a healthy haircut, Gemma's hair was a complete transition from black as night to as bright as sunshine on a summers day!" Step 1: Starting at the top section of the back of the crown, I applied powder lightener and Nak 20 volume, starting at the ends first and applying the lightener quickly so that the lift was even and consistent. I applied he top sections first for the most lift on the hair that would be most visible in our end result. Step 2: After applying all of the ends with powder + Nak 20 volume, I went through with powder lightener and 10 volume as the roots were virgin hair so I usually go low and slow with volume and lifting time. Total processing time for the first application of lightener was one hour. Step 3: After shampooing and doing a Nak Structure Complex stand-alone treatment for 10 minutes the hair was ready to have a second application of lightener -- powder lightener and 20 volume with Nak Structure Complex and a developing time of 45 minutes. It is crucial to use a plex when lightening beyond manufacturer's instructions; we can break the rules when we judge the hair type and feel the integrity but I always ensure that my clients walk out of the salon with luscious and soft hair. If a desired color takes two appointments it makes your better stylist to stay within the boundary of what the hair can handle at one time. Once the second powder lightener was taken off my client's hair we agreed we needed to keep the brightness, having achieved such a beautiful and bright lift from our double application. Step 4: To have a rich yellow on the roots and an electric yellow on the ends to even out the color (the pre- existing warmth in the ends and super light roots) we went with a Manic Panic Solar Yellow in the pro line applied on 80% dry hair and Manic Panic electric banana on the mid lengths and ends. Underneath I used Electric Lava Pastelised to color melt some of the yellow down into the warmer on the color built up ends to mask the brass ones and boost and amplify it with a deliberate electric lava! Because I left a halo section of the top solar yellow/ electric banana this really diffused the color melt and blend and gave it an extra seamless transition of colors. I added Nak structure complex in to the Manic Panic. The total processing time for the Manic Panic was 30 minutes, knowing the longer I left it the more effective the Nak Structure Complex would benefit her hair. FOLLOW UP & MAINTENANCE: "I've checked in with her two weeks after the service and the color is holding up really well. Manic Panic Professional lasts 40 shampoos which will mean the investment of my client $485 Australian for a color correction double bleach application, Manic Panic toner, Nak Structure Complex Treatment and a healthy cut will be worth her investment. "Maintenance appointments for a scalp bleach, treatment and Manic Panic toner will range from $290-$335 maximum for Gemma, as maintenance won't take as much time or product. In the salon I charge based on product and time, as well as how many tubes of Manic Panic I use and factor in the time it takes as an artist to apply and blend the color as well." FINAL WORDS: "Clients are happy to invest in their hair when we provide a specialized service and I think as a stylist it's also important for us to value our time, skill and passion as artists who provide a service to the public."